Flents Breathe Quiet Review – Stop Snoring! 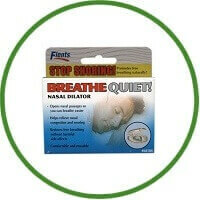 Flents Breathe Quiet – Stop Snoring! Flents Breathe Quiet is a simple and innovative device that gently stimulates the septum to improve airflow in the nasal cavity. The Breathe Quiet nasal dilator can be used day or night to make breathing easier. It also encourages sound, restful sleep by relieving hard breathing and snoring.